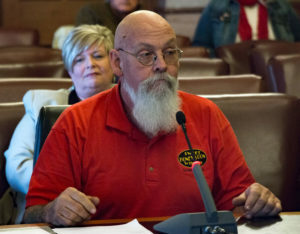 DES MOINES — A bill to get rid of permit requirements for buying and carrying a pistol or revolver in Iowa has cleared its first hurdle in the state senate. Scott Jones, a Virginia-based lobbyist for the National Rifle Association, was in Des Moines to speak at a hearing in the capitol Monday. “Self-defense situations are difficult, if not impossible to anticipate and law-abiding citizens should not be required to pay government-mandated fees and navigate a licensing system in order to exercise a fundamental individual right,” he said. Tim Coonan, a lobbyist for a group called Every Town for Gun Safety, said Iowa gun laws already are among the most permissive in the country. “At this point in our country’s history, given all the events known and unknown, it’s hard to imagine a scenario pulling back on systems that have most likely and in many cases have been proven reduce or prevent gun violence,” Coonan said. Two Republicans on a subcommittee voted to make the bill eligible for debate in the Senate Judiciary Committee. The Democrat on the subcommittee said he was concerned about giving Iowans considering suicide, especially veterans, quicker access to guns.